A comprehensive musical honors festival for winds and percussion. The Winter Festival is a unique concert band and chamber ensemble festival for high school students. The festival is designed to give participants an outstanding and comprehensive playing experience. Festival participants are chosen through a recorded audition process. 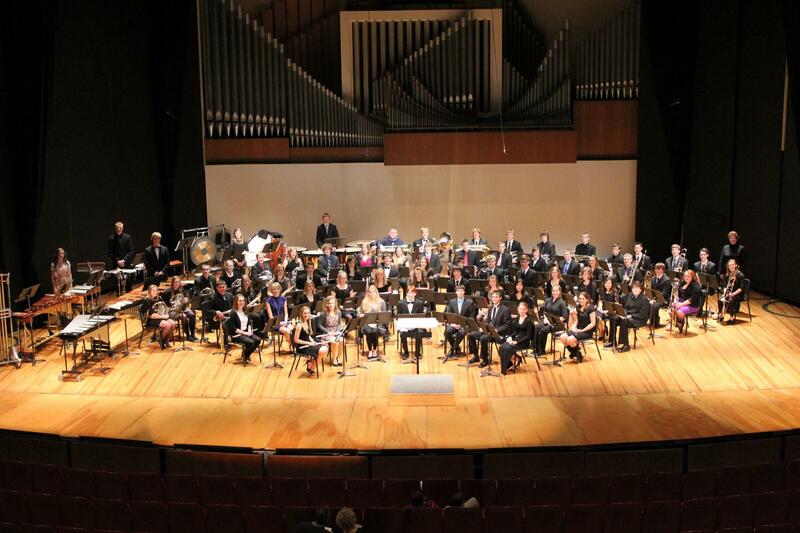 Students attending the festival are involved in three different ensembles: an honor band; a chamber ensemble coached by one of the Glenn Korff School of Music's talented applied wind and percussion faculty; and a large symphonic band that combines the festival honor band with the University Wind Ensemble. Students also participate in a masterclass with the applied wind and percussion faculty. If you have questions after reading this information thoroughly, please email the Band Office or call 402/472-2505. The University is committed to providing appropriate accommodations to guests with disabilities. In order to ensure that appropriate arrangements can be made, guests with disabilities who need reasonable accommodations must contact the Band Office at 402-472-2505 at least three weeks prior to their scheduled arrival on campus. Westbrook Music Building is accessible to persons with disabilities. We are including harp in the instruments that we are seeking for the 2019 Winter Festival. Please see the Winter Festival audition preparation page for details. Housing is provided by the University at the Graduate Hotel (9th and O Street in Lincoln) to those students that request it on the application form. Glenn Korff School of Music students will serve as chaperons. The Saturday evening meal will be provided. All other meals are the responsibility of the participants. Many fast food and other restaurants are within easy walking distance of the campus. Students may commute from home to the Glenn Korff School of Music if they wish. There is a $5 submission fee for the on-line application process. All festival participants will be charged a $25 registration fee payable after the audition results are announced. The Chamber Ensemble Performance Workshop will feature all festival participants working with their chamber ensemble coach in a workshop setting. It is scheduled for Saturday, January 19 at 7:30 p.m. in Rooms 119 and 130 in Westbrook Music Building. Parents, teachers and friends are welcome to attend. There is no admission fee for this event. The Festival Finale Concert is on Sunday, January 20 at 3:00 p.m. in Kimball Recital Hall. The concert features the Honor Band, the University Wind Ensemble and the Festival Symphonic Band. Parents, teachers and friends are welcome to attend. There is no admission fee for the finale concert. A dinner is scheduled for Saturday, January 19 at 5:30 p.m. at the Graduate Hotel (9th and O Street in Lincoln). Festival participants are required to attend at no charge. Band directors of participants may also attend the banquet if they desire. Parents of festival participants may attend for a nominal fee (to be determined). A reception for festival participants, teachers and families will be held in Westbrook Music Building following the chamber workshop on Saturday evening. Senior students planning to major or minor in music at the University are strongly encouraged to schedule an audition for admission and scholarship awards on Friday, January 19 (morning only). The Glenn Korff School of Music has another audition day for brass, woodwinds and percussion in February. Read the audition requirements and suggestions on the audition information page before choosing your audition music. The application form is active from September 4, 2018 through November 21, 2018. No late applications will be accepted. The application form is posted on Slide Room and a $5 application fee must be paid with a credit or debit card.